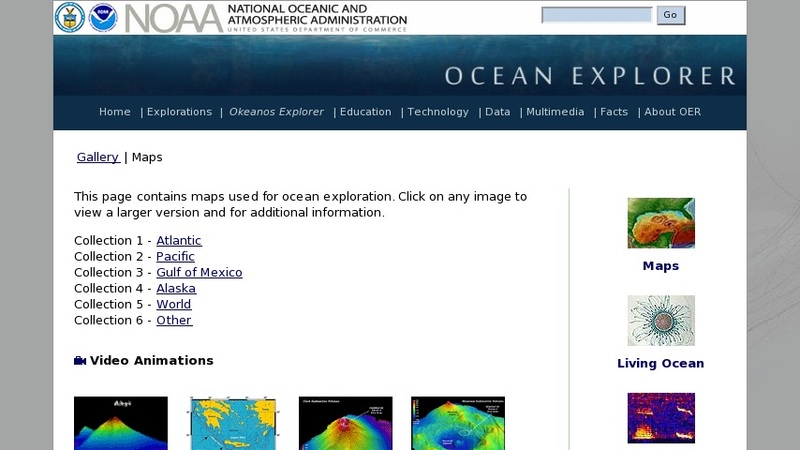 This National Oceanic and Atmospheric Administration (NOAA) site presents video animations and maps of exploration routes, bathymetry, undersea tracks of submersibles, satellite imagery, aerial photography. The section of animated images includes a three-dimentional flythrough created by using bathymetric data, video animations of a mid-ocean spreading center, an animation of the subduction zone, a subduction zone plate boundary, a hydrophone animation, a 3D rotation of a reef, a sonar mapping video, and a hydrothermal vent site. Some images have a downloadable high resolution version. Images are from all over the Earth and are divided by ocean areas.